Agnes Palfi graduated in Budapest specialized in business and trade obtaining BSC degree and then she started to work in her profession. Once she was invited to an important event but she wasn’t able to find the proper dress for the occasion so she decided to make her own one. 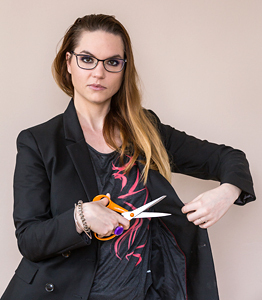 She realized that this way was harder than she had thought before – it was the point when she decided to start learning this new profession: tailoring and designing. She graduated at Budapest Fashion School as a dressmaker in 2012. Later tailoring has become her new profession because she has realized how much she loves fashion and design. Agnes combines modern and traditional lines in her designs and she is not afraid of mixing different styles. Her clothes are made of high-end quality materials and due to the clear-out cut lines all of them last long and will be the favorite pieces in a woman’s wardrobe. As a designer Agnes prefers natural materials like cotton, sheer and silk so customers can wear them comfortably in every season. Agnes thinks that good-quality clothes are for women’s body and soul: they can make us happier and more confident. The dressmaker believes that we don’t need perfect shape to look good and be confident in our body because none of us is perfect. Agnes’s mission and vision is to make clothes for ’Real Women’ who wants to be pretty, elegant and chic in every situation (although they are not supermodels). Her designs are stylish, chic and they show the beauty of a woman’s body in a classy way.